Yara's new ternary molten salt is particularly suitable for use as themrla storage and a heat transfer fluid for CSP plants using parabolic trough technology. Part 1. A new molten salt has been launched by Yara with the potential to drive down the costs of solar thermal energy and boost plant efficiency. Gail Rajgor spoke to the company's Emilio Iglesias to find out more. This article is taken from the January/February issue of Renewable Energy Focus magazine. To register to receive a digital copy click here. Following two years of research and positive laboratory testing, a new grade of potassium calcium nitrate now available from chemicals company Yara is set “to change heat storage in the global solar market”, the firm says. 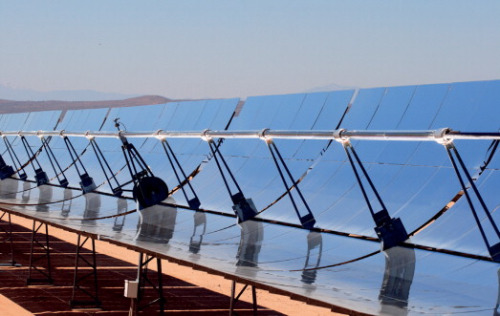 CSP (or solar thermal power) uses mirrors or lenses to concentrate a large area of sunlight onto a small area. This concentrated light heats water, thermal oil, or molten salts, which drive a steam turbine connected to a power generator. In terms of molten salts, these are injected into the system's piping, storage tanks and hydraulic systems. The new Yara approach would add potassium calcium nitrate as a third (ternary) salt to the usual binary mix of sodium nitrate and potassium nitrate. This new solar technology solution is chloride- and amonnia-free and contains high purity potassium nitrate. Solar thermal energy using molten salt as a heat transfer fluid (HTF) and storage technology is an alternative to photovoltaic (PV) solar power, which uses solar panels to convert sunlight into direct current electricity. Since CSP separates collection of solar energy and power production, electricity can be stored and generated as needed, meaning it is available at night or in inclement weather, Yara explains. Based on research conducted at the Yara Porsgrunn Technology Center, the new potassium calcium nitrate, or PCN, heralds a new generation of molten salts for use in solar thermal power. The company says when used as an HTF for the storage and transfer of solar thermal power, the ternary molten salts push down solar power costs through improved performance, lower life-cycle costs and increased safety. This is necessary, as CSP has been under pressure from solar technologies like Solar PV for some time. Lowering the melting point means you can work with a wider temperature range to absorb the energy. “The current binary salts absorb energy from 250 degrees to 560 degrees. We start to absorb the energy at 131-550 degrees, so here you have a big advantage because you need less molten salts in the storage tank and you increase the efficiency of the system. Additionally PCN is cheaper,” he says. Wider temperature range (Wider delta Tª) means you will need less molten salts to produce solar thermal power, while the new molten salts give comparable performance to binary salts at high temperatures. Reduced risk of molten salt solidification, which has been a technical challenge causing plant damage, stoppage and maintenance costs for previous molten salt technologies. Potential solidification, or blocking, of molten salt in the system when temperatures fall is a “big threat”. If blocking happens the system collapses. “Once molten salt is solid you have a big problem in that you have to cut where the molten salt is and take out the solid and start again, so it would be a big, big mess,” Iglesias explains. It is not a common problem, but plant operators must be aware of it. Binary salts can be prone to solidifcation when temperatures dips below 250 degrees. “That creates a big problem because the molten salt must be liquid for the 30 or 40 years that the plant will last, so any problem on lower range temperatures is a big issue,” Iglesias explains. The salt must be maintained in a molten state and so kept at the proper temperature, and when necessary, this is done via other electricity means (eg gas powered) in event of temperature falls outside. With Yara's salt performing well at lower temperatures compared to binary salts, the potential need for other electricity sources to maintain temperatures is reduced. With this comes a boost in overall plant efficiency and operating costs, Iglesias stresses. About: Gail Rajgor is Managing Editor of Renewable Energy Focus magazine. CSP is more efficient than solar PV. This breakthrough will make it CSP more popular.